Silent Sky Project#11 May 27th 2006, 7.01 – 7.31 pm, 10 participants, Bilin, Ramallah, Palestine. 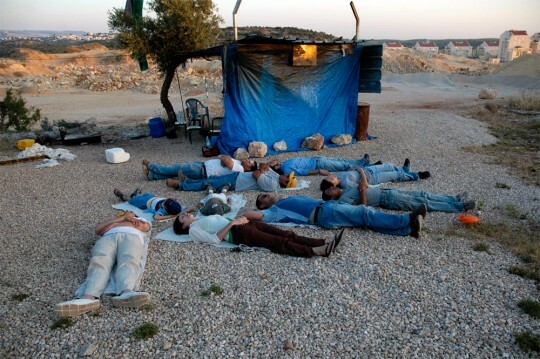 An international group from Palestine, Spain, Israel and Holland participated in a silent conversation with the sky. The location is in the center of the conflict zone, next to the wall the Israelian government is constructing a fence to seperate the people from Israel and Palestine. Left: Walking between the fences at the wall. Presentation and discussion about the project. Right: During the action an Israelian military patrol came to have a look, nobody moved and the performance was not interrupted.